With the upcoming set completely spoiled, New Phyrexia, I’d like to take a look at the set, and pick out the cards I would recommend looking out for. 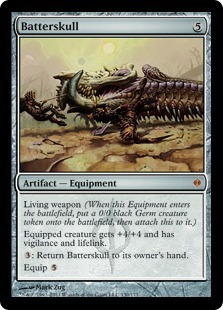 1) Batterskull; I’ve been saying it ever since the spoiler dropped, this card is very powerful. Probably the most powerful in the set in terms of standard. It’s effectively immune to removal as long as you have three mana open; it beats and defends well at the same time. Sure, Stoneforge Mystic can drop it on turn three, but without the little white creature, it’s still a formidable card, that wins attrition wars. It’s very much a classic control win condition, it works well with the large manabases of control decks, it’s very hard to deal with, and has a very powerful impact on the game. I expect this card to have a massive impact on standard during its two year stretch. 2) Torpor Orb; a fantastic utility card for standard, able to shut down a lot of creatures, from Stoneforge Mystic and Squadron Hawk, to Primeval Titan and co. What’s even better is there is UB planeswalker who can make use of two mana artifacts very well. I expect this to be a staple in Tezzeret, agent of bolas decks for the near future. In terms of Legacy, this allows some shenanigans, Phyrexian Dreadnought is already a good creature thanks to Stifle, but now instead of running Trickbind as well, they can play the orb, which also opens up possibilities like Eater of Days as additional beat-sticks. 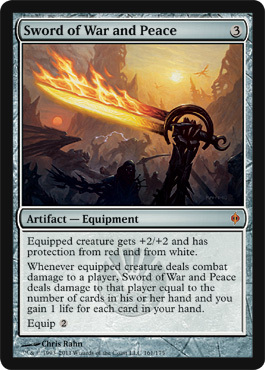 3) Sword of War and Peace; It’s a pretty obvious choice, since the last card of this cycle made such a dramatic impact. This sword is pretty powerful, whilst it doesn’t have the card advantage ability like all the other swords (great consistency of design there); it has two very relevant abilities. The ability to deal extra damage means you can attack a player, and kill their planeswalker at the same time, as for the life gain, along with protection from red; it will have an impact in Legacy since it’s rather potent against aggro. These are obviously the big three, but there are a lot of other cards with uses. Phyrexian Obliterator for example is an amazing powerhouse, drawing people back to Mono Black, along with the new version of Nightmare Lash. However the non-rares in this set have a lot to offer as well. Mental Misstep, Gitaxian Probe and Noxious Revival all have applications within Legacy and as for standard; we are offered Tezzeret’s Gambit, Geth’s Verdict and Despise. Plenty of tools to shake up the format indeed. Lastly, I’d like to make a mention of one other card, Life’s Finale. It’s nice to see destroy all creatures back in black, and it’s as a reasonable enough cost to see play. It’s extra ability of extracting further creatures is very welcome, since for a UB control player destroying an opponent’s board, the last thing you want is for them to untap and cast Sun Titan, undoing all your hard work. 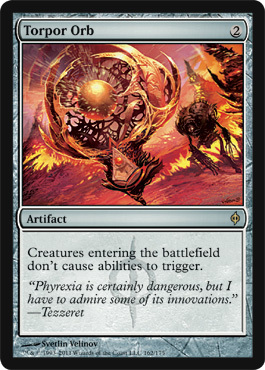 I expect to see UB control decks running a couple of these, since for the same cost as Black Sun’s Zenith for X=4, you can get a more absolute form of destruction capable of purging further Titans, whether they be Primeval or Grave, the usefulness is clearly there. In the future, I suspect UB control decks will divide their removal between these sweepers, since Liliana Vess being able to tutor up Black Sun’s Zenith several times is still a useful ability. To see the cards I’ve been talking about as well as the rest of the whole set, take a look at the official spoiler here.